In Mumbai, cab drivers vie to make their vehicles stand out from their competitors', decorating them with exuberant expressions of the driver's personality. But the upholstery for the seats and ceiling is traditionally left out of the decorative projects. Enter Taxi Fabric, a company that makes full-bleed, gorgeous upholstery fabric for the interiors of Mumbai's cabs (and cabs from other cities, assuming willing drivers!). The company's Tumblr features passengers and drivers filled with delight by the visual feasts on offer in the cabs' interiors. The designs are produced by artists who value the exposure to new audiences. Taxis in India, particularly in Mumbai, are not only the most convenient form of transport but have also become an iconic piece of culture. Although much attention is given to each taxi by its driver - to make it stand out from his competitors - very little thought is given to the fabric used on the seats. The designs that cover the taxi seats are often functional and forgettable and with the outstanding design talent Mumbai has to offer, this shouldn’t be the case. Design, as a job or even simply something studied at school, is unfortunately not widely recognised in India. Older generations don't understand it- design to them, just performs a function. Many people don't know that design can create a real impact. With so few spaces for young people to show off their skills, it's hard to change that perception. 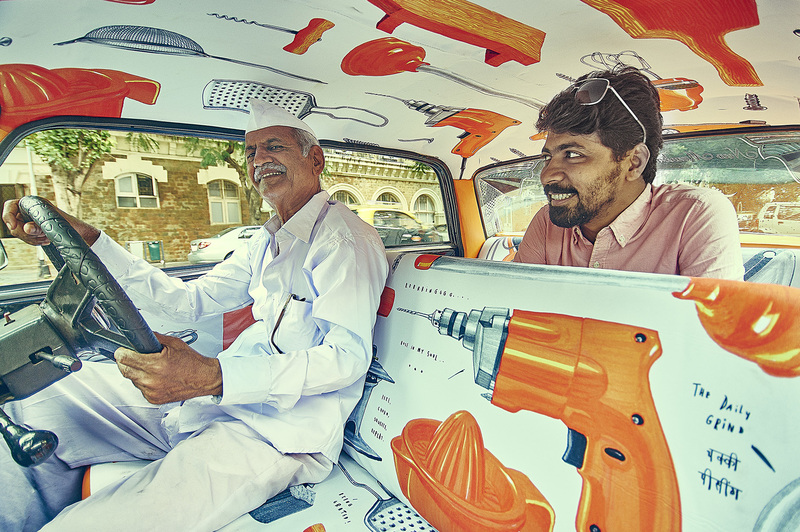 We put two and two together and started connecting designers with taxi drivers- turning seat covers into canvas’ for young Indian designers to show off their design talent and storytelling skills.